A study published this week in JAMA Internal Medicine concluded that some commonly used medications significantly increase an older person’s risk of developing dementia. The study followed over 3500 people for 17 years and tracked their use of drugs containing a specific neurotransmitter that interrupts the operation of involuntary muscles in the body, and interferes with the processing of information in the brain. These drugs, called anti-cholinergics, slow involuntary muscle action in the lungs, urinary and gastro-intestinal tracts. Thus they are used to ease asthma and bronchitis, urinary tract infections, nausea, and diarrhea. They tend to make people drowsy, and so they are also found in sleeping aids. Anti-cholinergics are also used in first generation tricyclic anti-depressants. 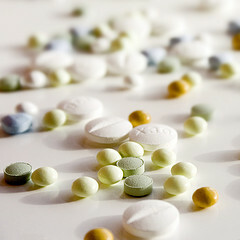 They are found in both prescription medications and over the counter drugs. Some commonly used anti-cholinergics include Benadryl, Dramamine, Chlor-Trimeton, Sominex, Advil PM and Spiriva. The discontinuation of the drug does not eliminate the risk of developing dementia. This study was led by a pharmacist who worked with a long term study in Seattle using people who were members of Group Health, an integrated health system. All participants were over the age of 65, had been enrolled in Group Health for at least 10 years, and thus the researchers had access to the computerized pharmacy records for this time period. All participants were screened at the start of the study to confirm that they did not have dementia. The researchers then followed this group of 3500 people for the next 7 years, and visited with them every two years. During these visits, the participants were again tested for dementia. Those whose scores suggested that they had become cognitively impaired underwent a full neurological workup. This study is known as an observational study. It is designed to identify possible associations between an exposure to a drug and the development of a disease. The data from this study clearly show an association between long term use of these drugs and the development of dementia. However, the study was not designed, and does not determine, the reasons for this association. What to do if you are taking one of these medications? The principal investigator of this study suggests that those who are routinely taking a drug with anticholinergic properties, whether a prescription drug or an over the-counter medication, talk to their physicians. When possible, older patients should switch to alternate medications that do not contain these anticholinergics. If there is no effective substitution, older patients should take the lowest possible dose for the shorest time possible.